"Love apple" is an old-fashioned common name for a tomato. Weird, huh? Over the years, the Forest Park Community Garden has been the beneficiary of a lot of love. From volunteers, businesses, elected officials, and garden members. When Gina and Jessica started the community garden a few years ago it was a labor of love. It still is today, but thanks to people like you it doesn't feel so much like work. So, in an effort to spread some love around Forest Park, the community garden has grown just over 200 tomato seedlings, and we're giving them away for FREE. Yes, a free tomato plant. What's the catch? 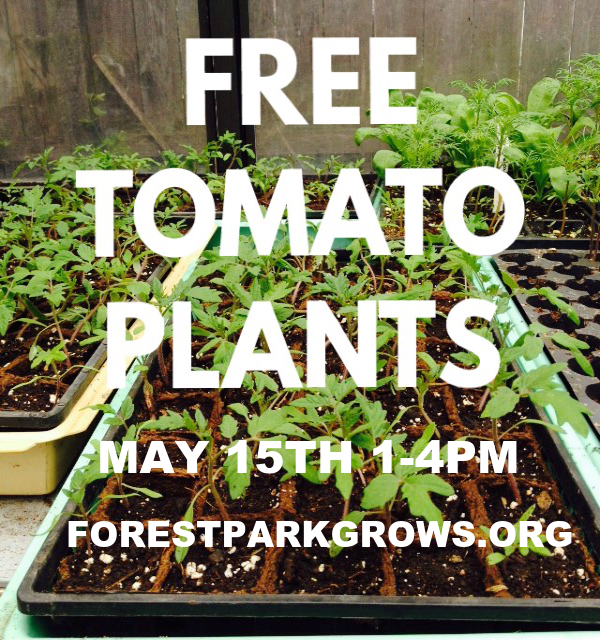 There isn't one really, just stop by the Forest Park Community Garden from 1-4PM on May 15th 2016 to claim your very own naturally raised tomato seedling. You don't need to be a community garden member to get a free seedling. Everyone is welcomed to stop by and get a free tomato plant while supplies last. Check us out in Twitter, Instagram & Facebook. And look out for our hashtag #FORESTPARKGROWS where we'll share pics and info. How do you get to the Forest Park Community Garden? The easiest way is to walk or bike down the alley behind the Thorntons. There is no parking available and cars cannot stop or park in the alley. June 11th from 11am-12pm. Join us as the community garden hosts former Forest Park resident, Tom Marrero, PhD. Tom is co-owner of Wakefield Biochar. Biochar is a premium quality soil conditioner that gives your plantings the best opportunity for success because it helps create a healthier soil. Biochar is made through an environmentally sustainable, organic and green process. The end result is a “char” that will have a positive impact on the soil. Biochar retains water and is drought resistant. It enables beneficial microbes to grow and increase soil health. It will hold the nutrients vital to plant growth near the roots of the plants and many other wonderful things. The first 15 attendees will receive a sample of Wakefield Biochar to try in their own garden. 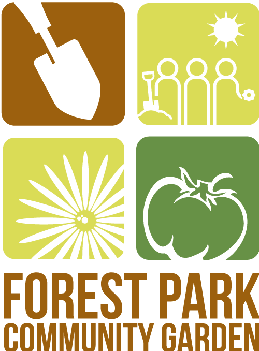 RSVP on the Forest Park Community Garden Facebook events tab. July 12th from 6:30 to 8pm. In partnership with the Forest Park Public Library, the community garden will host the Chicago Honey Co-op. Come learn about the basics of beekeeping and creating a bee friendly garden. RSVP on the library's event page.